Iceland. Greenland. The Faroe Islands. We at Nonni Travel truly believe that those three countries are the most awesome places to be! Each country itself promises a unique experience and unforgettable memories. Each of them is completely different, each of them carries their own unique signature and spirit but they all stand for their breathtaking natural beauty, their pureness and authenticity and their fascinating Nordic cultural heritage and lifestyle. Nonni Travel is a fully licensed travel agency and tour operator located in the beautiful North of Iceland. 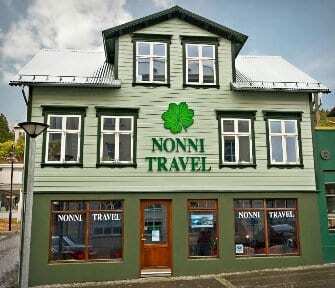 Nature lover Helena Dejak founded Nonni Travel in 1988 and managed the company for more than two decades until Ingi Þór Gudmundsson made his dream come to and stepped into her footsteps 2016, together with the Nonni Travel team. In 2018 Nonni Travel celebrates 30 exciting years of company history and is proud of being a trustworthy & reliable name and source of inspiration to our clients and partners from all over the world. Within its history Nonni Travel even received The World Wildlife Fund (WWF) Heidi Andersson Pilot Project Award for excellent work and dedicated participation in linking tourism and conservation in the Arctic. We feel proud of this reward. We want our clients to experience the spirit of the Arctic that we love so much and show them what we believe are Europe’s best hidden secrets. We want our customers to enjoy themselves, to be able to connect with the beauty of our destinations and go home with this certain glow in their eyes and a lot of good memories.